NOT since Cologne was rebuilt half a century ago, out of the rubble of war, has a change in the urban landscape generated so much heat. A city whose main landmark is a medieval cathedral may soon share its skyline with another place of worship: a large mosque with minarets more than 50 metres (165 feet) high. 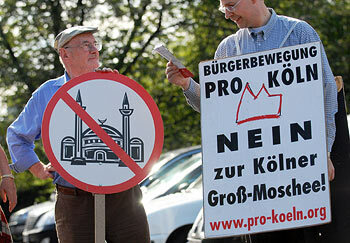 His comments dismayed Germany's four main Muslim associations, all of which have headquarters in the city. Whatever its importance to other faiths, Cologne is a sensitive spot for German Islam. It produced Metin Kaplan, a militant cleric known as “caliph of Cologne”, who was convicted of incitement to crime and extradited to Turkey in 2004. The would-be builders of the new mosque are at the other end of the respectability scale: the Turkish Islamic Union for Religious Affairs (DITIB), an arm of the Turkish government. All over the Western world, mosques and mosque-building plans are generating passionate arguments, particularly in local and municipal affairs. In many cities, both opponents and supporters of Muslim construction projects have realised that this issue engages voters far more than drains or libraries do. In the east London borough of Newham, for example, proposals to build a “mega-mosque” to accommodate at least 12,000 worshippers have divided local people (of whom at least a quarter are Muslim) and drawn global attention. British Muslims have been lining up for or against Tablighi Jamaat, the conservative missionary movement behind the mosque. Some are dismayed at the thought that this hard-line group could soon become one of British Islam's most obvious faces, only a stone's throw from the site of the 2012 Olympics; others defend the movement's right to build, noting that Newham's existing mosques are visibly overflowing during Friday prayers. In Newham council, a new party—the Christian Peoples Alliance—has sprung up, mainly to articulate non-Muslim resistance to the mosque. And on the website of Gordon Brown, the prime minister, an experiment in e-democracy had an awkward result: some 277,000 people used a click to register their opposition to the mega-mosque, much the biggest sign of voter interest that the site attracted. In many places, the accommodation, both literally and metaphorically, of Muslims and their religious needs has led to some strange coalitions. In Boston in June, the capping of the minaret on a new mosque turned into an emotional celebration by 2,000 Americans, hailing the end of several years of conflict and litigation. The Islamic Society of Boston had in 2005 filed a defamation suit against pro-Israel groups and media outlets that accused the mosque's sponsors of extremist links. But liberal Jews and Christians helped solve the dispute; some hailed the fact that a Bostonian tradition of Jewish-Christian dialogue had been extended to Muslims. The terms of the mosque debate vary widely: in the United States, mosque projects often meet practical objections, to do with “zoning”, water supplies or parking, but they are usually overcome, helped by a legal system that protects all faiths. In southern European countries like Spain and Italy—where attachment to Catholic symbolism is strong—people are much blunter about expressing their objections in cultural terms: this is a Christian land, and mosques have no place here. In Rome, on August 21st, police halted work at a site on the Esquiline hill, in an area with a high immigrant population. The sponsors of a planned mosque there were found to have begun work without seeking permission from the local authority. The new building was to have gone up just a few metres from a Catholic church; for some, that was the most important point. A spokesman for a new far-right movement, La Destra, called it “an insult to Christian culture”. But California is itself no paradise for Muslims: a mosque near San Francisco has just been burned down. Christina Abraham, a civil-rights lawyer in Chicago, says mosque builders around her city often have to work twice as hard as other religious groups to get the necessary permits, even though they do eventually get their way. One mosque in the Chicago area faced an apparently malicious regulation which banned parking for three hours on Friday afternoons—the time when worshippers were arriving. Lawyers successfully challenged the rule, on grounds of religious discrimination. In some European countries—like Germany—the atmosphere faced by would-be mosque builders varies a lot, even within cities. Berlin is one example. In the western district of Kreuzberg, Turkish migrants and their prayers have been part of the scene for decades. But in the capital's east, local residents and politicians from the far-right NPD party are leading loud protests against the building of the first mosque in the ex-communist part of the city. In Munich, meanwhile, the conservative government of Bavaria is locked in battle with the centre-left dominated city hall over the plan for a new mosque. For now, the conservative opponents seem to be winning; a local court has called the current plan incompatible with the surroundings. If controversy over mosques is getting louder in Germany now, that may be because the Turkish community has only recently started claiming citizenship and the right to vote. On the other hand, a much higher share of France's 5m Muslim residents is enfranchised; and yet in some French town halls, the politics of mosque-building are explosive. In Marseille, which is home to 200,000 Muslims but also a bastion of the far right, arguments over the construction of a large mosque have dominated city debates for years. The municipal council voted in July to go ahead, overcoming a raft of legal objections from the far right, which said the Muslim builders got public land (an old abattoir) too cheaply. This week the far-right said it would mount a fresh legal challenge, on grounds that the price being paid for the land was still not enough. Opponents of mosque building in Europe often claim that the number of mosques is rising much faster than the number of Muslims. That is a hard proposition to test. Statisticians cannot even agree on the definition of a mosque. Idriss Elouanali, editor of the “Yearbook of Mosques” in France, says that in his 2006 survey he used two definitions: first, he counted roughly 100 purpose-built mosques, and then 1,525 prayer rooms, big enough to have Friday sermons with a recognised imam. The combined figure of 1,625 was 75 up from the Yearbook's first edition in 2003, hardly a surge. But Mr Elouanali points out that in the late 1970s, France had fewer than 50 prayer spaces. In the United Kingdom, says Inayat Bunglawala of the Muslim Council of Britain, the number of mosques has jumped in the last 20 years from under 400 to 1,699 registered places of prayer today. Alexa Färber of Berlin's Humboldt University sees a more qualitative change. Between 1998 and 2006, the number of mosques in Berlin grew from 66 to 76—a smallish rise. However, during those eight years 18 mosques moved location within Berlin: this added to people's perception that mosques were proliferating. More importantly, Ms Färber points out, 21 Muslim groups bought rooms or buildings, which in many cases had been rented before. These purchases usually went along with embellishments such as minarets. No wonder many people think Muslim worship is growing more visible. One explanation for the delayed building boom in Germany, argues Ms Färber, lies in the cultural obstacles faced by first-generation migrants. With a limited knowledge of their host country, they had to wait for their children and grandchildren, who grew up in Germany and understood the system better, to promote their interests. “Now there are more Turkish architects, lawyers or engineers who help to build mosques,” she says. Recently some Western governments have started to work more closely with Muslim minorities and encourage the building of new mosques. So why do so many conflicts persist? In fact, for every mosque that is impeded, many other projects go ahead. Moreover, as Mr Bunglawala notes, national politicians can only set the tone of the debate; actual decisions are taken by local councils. This distinction has become apparent in the German city of Duisburg, north of Cologne, where the local DITIB branch is also building a large mosque. There, thanks to good co-operation between religious communities and better communications, construction is going ahead much more smoothly. Despite such local contrasts, Jocelyne Cesari from Harvard University argues that there are national patterns at work. “In places with a long history of immigration, such as France, Britain or Belgium, resistance to mosques is losing its force,” she believes. In contrast, opposition is stronger in Spain or Italy, where Muslim immigration is relatively new. If Ms Cesari is right, then it may be that reaching a reasonable accommodation between Muslims and non-Muslim majorities over issues of urban planning is only a matter of time. Is that too optimistic? It may well be true that in many countries, Muslim and non-Muslim elites will get better at understanding one another. But the question is whether grassroots politics will evolve at the same pace. Given the dividends that some local politicians are reaping from backing mosques, or opposing them, that seems a less sure bet.